Work is starting on a £44m upgrade of the train line between Wrexham and Chester. It will cut journey times between Holyhead and Cardiff and will allow an extra train to run every two hours between the two stations, via Wrexham. The work is expected to be completed early next year. Transport Minister Edwina Hart said people in north east Wales "would benefit from the improved rail links to the rest of Wales". The work includes improvements to the line between Shrewsbury and Gobowen and Rossett and Saltney Junction, Chester, which will help reduce journey times. Three level crossings between Wrexham and Saltney Junction will also receive upgrades. A direct rail link between north east Wales and Liverpool is to be restored, after being lost in the 1970s. Chancellor George Osborne announced a £10m scheme to upgrade the Halton Curve rail line, linking Liverpool, Cheshire, Warrington and Wrexham. The project is part of a £34m package to improve transport connections between Liverpool and Manchester. Welsh Secretary David Jones said it showed ministers continued commitment to improving UK infrastructure. He said the news would "enable an estimated 500,000 more people to access employment, educational and recreational opportunities". "It will improve links to Liverpool John Lennon Airport and help stimulate further investment on both sides of the border," he said. "Today's announcement shows this government's continued commitment to improving our infrastructure across the United Kingdom, which is crucial to our long term economic plan." Passengers from Wrexham currently have to change at Bidston or Chester. The Federation of Small Businesses (FSB) said the chancellor's announcement would be welcomed by all companies in north Wales doing business with Liverpool. Its regional chair Gwyn Evans said: "Projects such as this, and the £44m upgrade of the rail line between Wrexham and Chester, will make a real difference. "However, there is still some way to go to provide north Wales with the transport infrastructure needed to keep our economy on track." A £12m scheme improving access for passengers at five railway stations in Wales has been unveiled. Stations at Machynlleth in Powys, Chirk near Wrexham, Ystrad Mynach in Caerphilly county, and Llandaff and Radyr in Cardiff will all benefit. The cash will be used to create step and obstacle-free routes to platforms and station entrances through new footbridges, lifts and ramps. The funding has come from the Welsh and UK governments. Work will start at Ystrad Mynach later this month, with the other projects starting in May and June. Transport Minister Edwina Hart said: "This scheme will greatly improve access to a number of stations and ensure more people can use the train. "Public transport is a vital way for many people, including some of the most vulnerable in our society, to access jobs and services. I want to make sure our rail stations are accessible to all and offer a comfortable experience for passengers." The work is being funded by £7m from the Welsh government and £5m from the Department for Transport. Mark Langman, route managing director of Network Rail Wales which will be carrying out the work, said: "These enhancements will help passengers get access to platforms and cross more easily between them through the installation of new footbridges with ramps or lifts. "Step-free access not only benefits disabled passengers or those with reduced mobility, but also people with children, heavy luggage or shopping. "In most cases, the improvements will open up the stations and the rail network to users who may not have been able to access them previously." New peak hourly trains between Aberystwyth and Shrewsbury will be among extra services to be funded by the Welsh government on the Cambrian and Heart of Wales rail lines. Transport Minister Edwina Hart has announced the new services will create 20 new train crew and depot jobs. The changes, which will be on an initial three-year trial basis, will come into place from May 2015. Rail users welcomed the move, saying both lines provide "vital services". On the Cambrian line, four new return services will operate between Aberystwyth and Shrewsbury from Monday to Saturday, with hourly services for peak morning and afternoon times. There will also be two new return Sunday services and an improvement to evening services on the Cambrian coast between Barmouth and Pwllheli. On the Heart of Wales line there will be extra journeys between Llandovery, Gowerton and Swansea, and between Llandrindod, Shrewsbury and Crewe from Monday to Friday. Other return services will become more conveniently timed, and the Heart of Wales Line Forum will get £150,000 to explore the possibility of further improvements to the line. Announcing the new services, Mrs Hart said: "I am very pleased that we have been able to secure the extra train services on these two popular lines. "I recently commissioned a survey which clearly demonstrated the benefits to commuters, local businesses and university students of an hourly service on the Cambrian line." The Cambrian Rail Implementation Group was formed by Mrs Hart to look into new services in mid Wales last November. It included representatives of Network Rail, Arriva Trains Wales and Aberystwyth University. 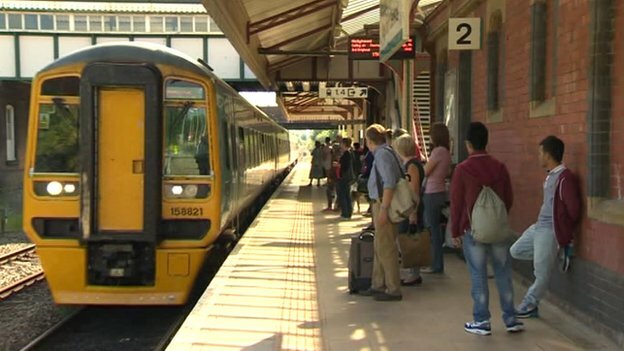 It followed a report by The Shrewsbury Aberystwyth Railway Liaison Committee which said hourly services could boost employment and tourism. Its report included 6,570 responses from residents, students and businesses in mid Wales, and also called for more trains on the coast line in the summer months. The Welsh government announcement was welcomed by Mansel Williams, chair of the Shrewsbury Aberystwyth Railway Liaison Committee and Heart of Wales Line Forum. He said: "Both the Cambrian and Heart of Wales lines provide a vital service for residents, commuters, tourists and students in the area. "We received a very strong response to our survey about services on the Cambrian main and the coast railway lines, which backed up the support there has been locally for an hourly service, particularly in the commuting peaks. "The Heart of Wales Line survey also highlighted the impracticality of commuting with the current timetable, particularly southwards into Swansea." Hopes for an hourly service along the Cambrian line received a boost in February when Powys planners gave the go-ahead to close five crossings on the network between Carno and Talerddig. The Network Rail project will also include replacing the crossings with two road bridges over the Aberystwyth to Shrewsbury line. Wrexham users won't travel via Halton to get to Liverpool, most will go via Birkenhead or Bidston!